Monthly Reads is looking a bit sparse this month with just one book, but what a book! My goal has been three a month, but I suspect I'll catch up. February felt so short and busy that I'm glad I was even able to read one book. Whenever I'm going through a lull in my reading, I can always rely on Murakami to pull me back in. I saw a lot of parallels between this book and Hard Boiled Wonderland and the End of the World-- themes like being reunited with one's shadow and libraries holding memories, and the way that parallel stories were told that eventually collided. Though I enjoyed the story, as I tend to in these novels, it's the character development that I really enjoyed in this one. Usually I feel like his characters are pretty predictable-- the protagonist takes the form of a seemingly typical male that was minding his own business when something odd happens to him, and thus a Murakami novel ensues. Oshima is the first gender nonconforming character I've come across in his books (who kind of reminded me of Cinnamon from Wind Up Bird Chronicle for some reason, maybe because I imagine both of them to be well-dressed) and I ended up wanting his character to be developed a bit more. 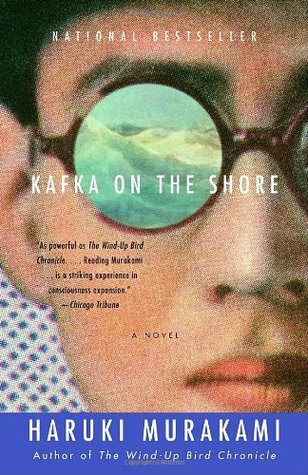 Kafka's character is a bit different that the typical protagonist and his age alone shifts this book into a coming of age tale (there's definitely more there than in Catcher in the Rye, blegh). And Nakata! What a wonderful character. Need I say more about a man who can talk to cats? It effectively leaves some questions unanswered, but isn't that the point? I could go on and on about the book, but not without spoiling some of the plot. Just read it! That's always my response to notions of Murakami, anyway.